Do you tell yourself, “I’m not good enough,” or “Things are far too difficult, why should I even try?” Words like this affect the way we feel and act. Negative self-talk leads to fear, anxiety, depression and a ‘why bother’ attitude. Rethink it! 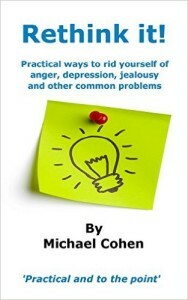 gives practical advice on tackling destructive thoughts that lead to anger, rejection, shame, jealousy, fear and worry. Rethink it! is a self-improvement tool kit that can be dipped into and doesn’t have to be read from cover to cover. Learn how to be more assertive, improve your communication, have better relationships and even overcome blushing. Michael Cohen is a London therapist with more than 28 years of experience and is bestselling author of The Power of Accepting Yourself. Essential reading for anyone looking for self-help strategies that work.